Warning: heavy generalization and stereotype thinking ahead! PM: Did you get that? Developer: Is this what you need? Engineer: Let me start a Git repo to collaboratively build this algorithm, so I can move on with the rest of my big plans. This took me a while to figure out, but I finally got the missing piece figured out. I'm using Telenet as an ISP to provide access from my home network. I have a linux box acting as a gateway router for the home network with some basic services that I use in my home. The ISP has IPv6 enabled on their cable modems for a while, and I've been trying to extend that IPv6 network into my home network. After all, they're handing out a /64 to all end users. Here's how I got it to work. The situation looks like this. The Telenet router is the ISP provided cable modem. After that I have my Ubuntu linux gateway. For the examples later, eth0 is the home network, eth1 is towards the internet. I'll focus on the IPv6 specific settings in the remainder of the post. Note that I added an explicit metric. If I didn't do this, the default route that is assigned to eth1 would get the upperhand, and I wouldn't be able to properly communicate within my home network since the gateway would send all traffic out the door. 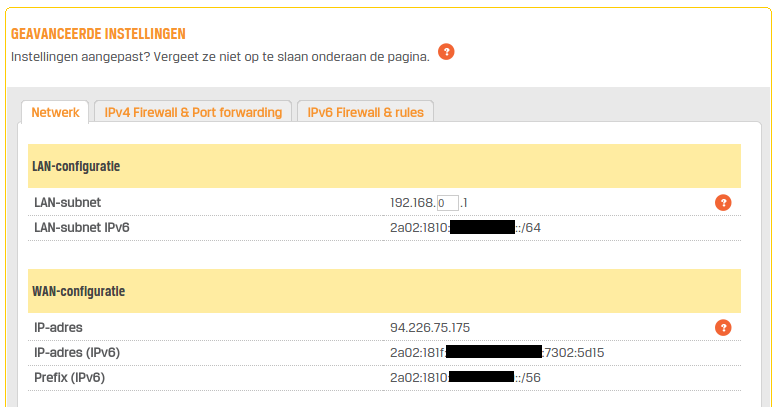 Ensure to configure the firewall on the "Mijn Telenet" ISP admin page in addition to the firewall on the linux gateway. Now the last piece, which I couldn't figure out for the longest time: when requests come in from the internet (or responses from outgoing packets) the telenet router relies on IPv6 neighbor discovery to figure out who's behind it. The linux gateway router doesn't proxy such requests by default. You can compare this with ARP in IPv4. The Telenet gateway is trying to figure out who has got a certain IPv6 address, and sends out neighbor solicitations. The linux gateway will respond only when it hears its own address. We can tell it to respond on behalf of the hosts on the home network by installing ndppd. And that's it.. now the gateway will respond to IPv6 neighbor solications on eth1 for the entire /64 network. You should not be able to get to IPv6 enabled websites from within your home network. Most modern Windows computers will automatically configure themselves after the setup above. Give it a try and navigate to http://test-ipv6.vyncke.org/ and you should see a confirmation. I have a strong Java background and have messed around with various other languages but never become fluent in any of them. I guess because I didn't have to. Perl crossed my path early in my career, then Ruby became popular and later python. Now I'm looking at Go. Actually it's the third time or so I'm doing that, and this time there seems to be a click. What attracts me most is that it's fairly easy to pick up, and... it generates a single executable that can exist on its own without having to install a run-time environment. I assume that's one of the reasons why it's so popular in the cloud community these days (yes, next to python of course). Anyway, just a quick write-up so I don't forget how to quickly get started with Go after my next PC refresh. There's nothing new here... just summarizing few key steps in one place. Check the downloads section in the golang website for the latest and download it. Once there's good information on various tooling integration in /usr/local/go/misc. I'm interested in vi. Based on what's there in /usr/local/go/misc/readme.txt, here is the content of my /etc/vim/vimrc.local file.
" Some Linux distributions set filetype in /etc/vimrc.
" Clear filetype flags before changing runtimepath to force Vim to reload them.
" Reformat on exit/write of file.
" Close auto-complete window when exiting edit/insert mode. And that's it. You should now see syntax highlighting in vi. Ctrl+x, ctrl+o opens up auto-complete. Assuming you have docker installed on your machine, these are the few steps to take to get openhab up and running. Create a config directory and store your openhab configuration files there. This is the content of [OPENHAB_HOME]/configurations and will be injected into the container. Let's assume you chose /tmp/config. Now you can access the openhab installation on port 80 of your host.